I am going to give you a seriously flawed list. There's your warning, front and center! I think Brian Leiter's list of top general philosophy journals is more plausible as a list of best-regarded general analytic philosophy journals. 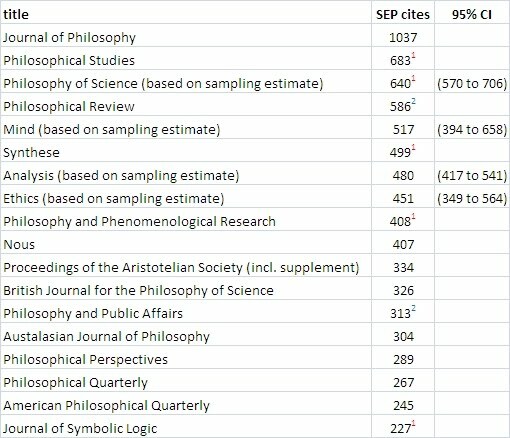 But for what it's worth, below are the most cited philosophy journals in the non-historical entries of the Stanford Encyclopedia of Philosophy. * This list reflects the perspective of the SEP editors and writers -- largely an "analytic"/anglophone perspective, among other things. * I am excluding historical entries and historical journals. * I checked all journals that I thought would plausibly be cited at least 100 times, but it's certainly possible that I have missed some. If you think there are journals that should clearly be on this list that are missing, feel free to let me know in the comments. Of course there are quite a few good journals below the 100 citation cut. Philosopher's Imprint especially comes to mind. It has published only 64 articles so far in its lifespan, so it hasn't had much of a chance yet to develop a big log of influential articles. * The numbers are noisy and approximate for a variety of reasons. Four journals, as indicated below, had titles common enough as bibliographic phrases that I was forced to do statistical sampling. * To the extent these numbers reflect prestige, they reflect prestige over time rather than current prestige. * Journals that publish many articles (like Phil Studies, Philosophy of Science, and Synthese) will be relatively advantaged by this measure, while those that publish few articles (like Phil Review and Philosophy and Public Affairs) will be relatively disadvantaged. 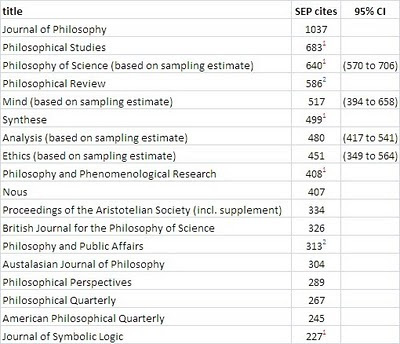 I tried dividing by the number of articles published in two sample years, but this made the rankings implausible in other ways as measures of prestige; so I leave the raw numbers and note exceptional cases. For what it's worth, my own impression is that Phil Review, PPA, and BBS are underranked by this measure relative to their prestige -- presumably due to their low rates of publication -- while Phil Studies, Phil Science, and Synthese, though all excellent journals, are a bit overranked, presumably for complementary reasons. I'm also inclined to think PPR and Nous are a bit underranked relative to current prestige. I find it interesting that Faith and Philosophy made the list, but Religious Studies and the International Journal of Philosophy of Religion didn't. I thought the general consensus was that these journals were a little better for philosophy of religion since they had wider interest; faith and philosophy is concerned with philosophical issues insofar as they pertain to Christianity (or so they say about themselves). Faith and philosophy is also relatively newer to the scene then the other journals. Did you by chance leave these other entries off? Or maybe my expectations were misguided on this issue. Anyway, interesting post and thanks for taking the time to make it! Thanks, Modal. The search term "Religious Studies" yields 95 hits, almost all of which are the journal. The search term ("International Journal" and "Religion") yields 51 hits. Since I excluded historical entries, part of the explanation might be a tendency to put work on non-Christian traditions in the historical entries. One might think that Phil Sci and (to a lesser extent) Synthese are unlikely to be overranked given that they are specialist journals: a journal like Phil Stud, which publishes across the range, has more opportunities for citations in an encyclopedia. That makes their performance all the more impressive. Eric, Did you explain anywhere why you excluded historical journals? I will forebear to speculate until you have had a chance to answer. All of this work you are doing charting and counting and so on is interesting in a parlor game sort of way. But, does it have any deeper significance? I think that it does, but in an unfortunate sense. First, you are wisely not even exhaling in the direction of the question, "Who should be most cited?" So, the point of all this number crunching can't be to show which philosophers are most important, much less which philosophers anyone ought to study. Second, this last point interacts with the natural question, "Why is this guy going to all this trouble?" After all, when someone counts up a bunch of stuff and then posts it for all the world to see, it's natural to wonder why the heck that person is going to all that trouble. True, perhaps it is an interesting project. We all want to know who is popular - who is hot, who is not, who is on the island, who is off, who is lame, who is cool, and so on... don't we? I mean, geez - Chisholm just ain't so cool anymore! And, I always thought Grice was cool but it turns out that he's actually not nearly as cool as David Lewis. But then again David Lewis was always the coolest, I mean who on earth is has more cool friends than David Lewis? The worry is that this is all part of a disciplinary norming - unintentional but powerful - that makes certain projects proper philosophy and others too far outside to take seriously. Finally, and perhaps most significantly, if we are philosophers, shouldn't we ask, "Who matters?" not "Who is cited most?" That is, why should we even CARE about the numbers? Seriously - I ask this seriously. 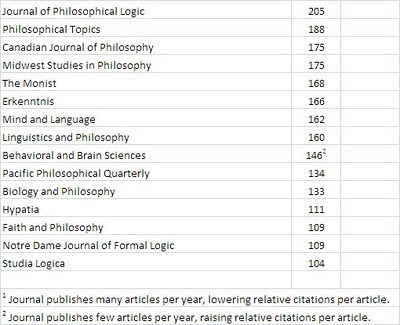 The reason I ask is that _Philosophy of Science_, excluding the PSA proceedings, only publishes about 30 articles per year, which is not that high. If you add in the Proceedings, you'll get another 40 -- but as I said, I suspect those are cited less often. Thanks, Greg. Yes, I am counting the PSA Proceedings in Philosophy of Science. It's less than ideal, but in the particular case, any coding decision has its advantages and disadvantages. Wondering: I am more sympathetic with your remarks that you probably suspect. You'll notice that the subject tag for this series of posts is "sociology of philosophy". It's explicitly about *actual* popularity and influence as opposed to *deserved* popularity and influence. I think the topic is worth studying for the reason the sociology of any discipline is worth studying. But... I also think there is something fun about the horse-race aspect of it, so I confess that I am also indulging in that. My main aim in this project is not to present horse-race results, but since horse-race results fall out of the sociological research I am doing, and since people find such results interesting, I am presenting them. Margaret: I excluded historical journals because I didn't include historical entries from the SEP in the bibliographic database I used, so the data on history of philosophy journals would be misleading. i am still somewhat confused. I understand about historical entries in your original project (I think) but the philosophers publishing in the history of philosophy journals are pretty much alive and kicking and influencing one another. Why not alter the methodology sufficiently to allow recognition of this fact? Margaret: I think that's a good idea, but I think the methodology might have to be pretty different. So it's a project for another time, or maybe another person. Thanks, Eric. I am feeling conscious of the fact that it is a lot easier to suggest projects for other people to do.